Loomis provided the earliest detailed description of various stages of sleep in the mid-1930s, and in the early 1950s, Aserinsky and Kleitman identified rapid eye movement (REM) sleep  . Sleep is generally divided into 2 broad types: nonrapid eye movement (NREM) sleep and REM sleep. Based on EEG changes, NREM is divided further into 4 stages (stage I, stage II, stage III, stage IV). NREM and REM occur in alternating cycles, each lasting approximately 90-100 minutes, with a total of 4-6 cycles. In general, in the healthy young adult NREM sleep accounts for 75-90% of sleep time (3-5% stage I, 50-60% stage II, and 10-20% stages III and IV). REM sleep accounts for 10-25% of sleep time. Stage I sleep is also referred to as drowsiness or presleep and is the first or earliest stage of sleep. 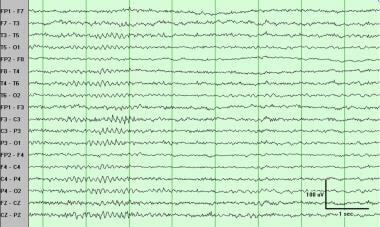 Representative EEG waveforms are shown in the images below. The earliest indication of transition from wakefulness to stage I sleep (drowsiness) is shown here and usually consists of a combination of (1) drop out of alpha activity and (2) slow rolling eye movements. Slow rolling (lateral) eye movements during stage I sleep. Like faster lateral eye movements, slow ones are best seen at the F7 and F8 electrodes, with the corneal positivity indicating the side of gaze. On this transverse montage, typical vertex sharp transients are seen. In contrast to K complexes, these are narrow (brief) and more focal, with a maximum negativity at the mid line (Cz and to a lesser degree Fz). These are seen in sleep stages I and II. Vertex waves are focal sharp transients typically best seen on transverse montages (through the midline) and would be missed on this longitudinal bipolar montage if it did not include midline channels (Fz-Cz-Pz). Vertex waves are seen in sleep stages I and II. Positive occipital sharp transients of sleep (POSTS) are seen in both occipital regions, with their typical characteristics contained in their name. They also have morphology classically described as "reverse check mark" and often occur in consecutive runs of several seconds, as shown here. Slow rolling eye movements (SREMs): SREMs are usually the first evidence of drowsiness seen on the EEG. 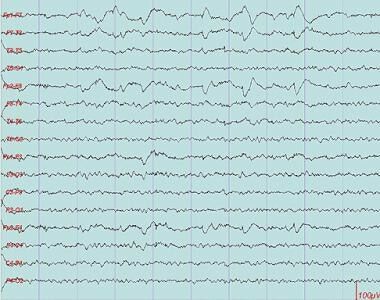 SREMs of drowsiness are most often horizontal but can be vertical or oblique, and their distribution is similar to eye movements in general (see EEG Artifacts). However, they are slow (ie, typically 0.25-0.5 Hz). SREMs disappear in stage II and deeper sleep stages. Attenuation (drop out) of the alpha rhythm: Drop out of alpha activity typically occurs together with or nearby SREM. The alpha rhythm gradually becomes slower, less prominent, and fragmented. Positive occipital sharp transients of sleep (POSTS): POSTS start to occur in healthy people at age 4 years, become fairly common by age 15 years, remain common through age 35 years, and start to disappear by age 50 years. 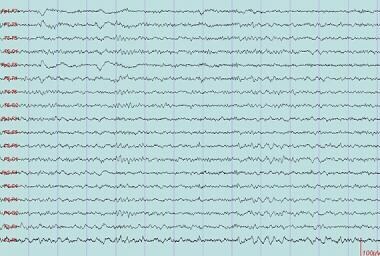 POSTS are seen very commonly on EEG and have been said to be more common during daytime naps than during nocturnal sleep. Most characteristics of POSTS are contained in their name. They have a positive maximum at the occiput, are contoured sharply, and occur in early sleep (stages I and II). Their morphology is classically described as "reverse check mark," and their amplitude is 50-100 µV. They typically occur in runs of 4-5 Hz and are bisynchronous, although they may be asymmetric. They persist in stage II sleep but usually disappear in subsequent stages. Vertex sharp transients: Also called vertex waves or V waves, these transients are almost universal. Although they are often grouped together with K complexes, strictly speaking, vertex sharp transients are distinct from K complexes. Like K complexes, vertex waves are maximum at the vertex (central midline placement of electrodes [Cz]), so that, depending on the montage, they may be seen on both sides, usually symmetrically. Their amplitude is 50-150 µV. They can be contoured sharply and occur in repetitive runs, especially in children. They persist in stage II sleep but usually disappear in subsequent stages. Unlike K complexes, vertex waves are narrower and more focal and by themselves do not define stage II. Hypnagogic hypersynchrony: Hypnagogic hypersynchrony (first described by Gibbs and Gibbs, 1950  ) is a well-recognized normal variant of drowsiness in children aged 3 months to 13 years. 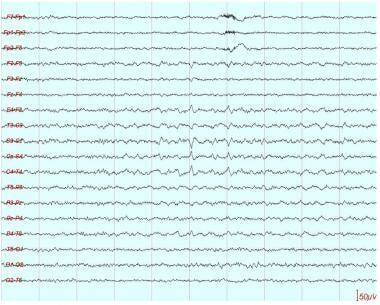 This is described as paroxysmal bursts (3-5 Hz) of high-voltage (as high as 350 µV) sinusoidal waves, maximally expressed in the prefrontal-central areas, that brake after the cerebral activity amplitude drops during drowsiness. The importance of normal sleep patterns is that they should not be mistaken for pathologic sharp waves. Several normal stage I patterns easily can be mistaken for epileptic sharp waves or spikes, including vertex sharp transients, POSTS, and even fragments of alpha rhythm as it drops out. Stage II is the predominant sleep stage during a normal night's sleep. The distinct and principal EEG criterion to establish stage II sleep is the appearance of sleep spindles or K complexes. The presence of sleep spindles is necessary and sufficient to define stage II sleep. Another characteristic finding of stage II sleep is the appearance of K complexes, but since K complexes are typically associated with a spindle, spindles are the defining features of stage II sleep. Except for slow rolling eye movements, all patterns described under stage I persist in stage II sleep. Representative examples of the waveforms described here are shown in the images below. This shows a K complex, typically a high-amplitude long-duration biphasic waveform with overriding spindle. This is a transverse montage, which shows the typical maximum (manifested by a "phase reversal") at the midline. Typical sleep spindles with short-lived waxing and waning 15-Hz activity maximum in the frontocentral regions. Note the associated slow (theta) activity that also characterizes stage II sleep. Vertex sharp transients. This transverse montage illustrates the maximum negativity (manifested by a negative phase reversal) at the midline. The location is similar to that of K complexes, but these are shorter (narrower) and more localized. K complex, with its typical characteristics: high-amplitude, widespread, broad, diphasic slow transient with overriding spindle. On the longitudinal montage (left), the K complex appears to be generalized. However, the transverse montage clearly shows that the maximum (phase reversal) is at the midline (Fz and Cz). A mixture of spindles (ie, bicentral short-lived rhythmic 14 Hz bursts) and positive occipital sharp transients of sleep (POSTS) can be seen. POSTS occur in stage I, but the presence of spindles is "diagnostic" of stage II. 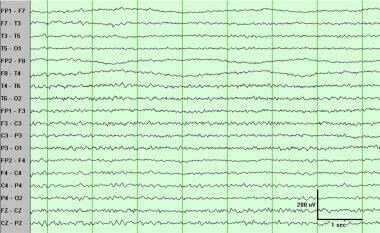 A mixture of positive occipital sharp transients of sleep (POSTS) and spindles (fronto-central short-lived rhythmic 14-Hz bursts) can be seen. Sleep spindles normally first appear in infants aged 6-8 weeks and are bilaterally asynchronous. These become well-formed spindles and bilaterally synchronous by the time the individual is aged 2 years. Sleep spindles have a frequency of 12-16 Hz (typically 14 Hz) and are maximal in the central region (vertex), although they occasionally predominate in the frontal regions. They occur in short bursts of waxing and waning spindlelike (fusiform) rhythmic activity. Amplitude is usually 20-100 µV. Extreme spindles (described by Gibbs and Gibbs) are unusually high-voltage (100-400 µV) and prolonged (>20 s) spindles located over the frontal regions. K complexes (initially described by Loomis) are high amplitude (>100 µV), broad (>200 ms), diphasic, and transient and are often associated with sleep spindles. Location is frontocentral, with a typical maximum at the midline (central midline placement of electrodes [Cz] or frontal midline placement of electrodes [Fz]). They occur spontaneously and are elicited as an arousal response. They may have an association with blood pressure fluctuation during sleep. The stigmata of stage II sleep, spindles and K complexes, are usually easy to identify and are less subject to overinterpretation or misinterpretation than the patterns of stage I sleep. Stages III and IV sleep are usually grouped together as "slow wave sleep" or "delta sleep." 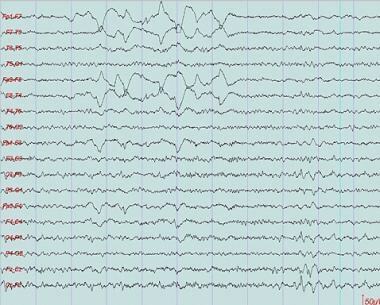 Slow wave sleep (SWS) is usually not seen during routine EEG, which is too brief a recording. 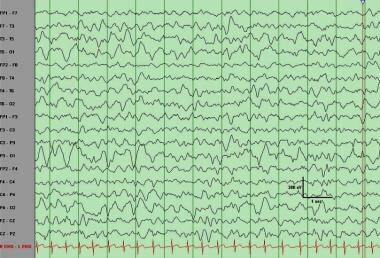 However, it is seen during prolonged (>24 h) EEG monitoring. Representative examples of SWS EEGs are shown in the images below. Slow wave sleep with predominantly delta activity, especially in the first half. Slow wave sleep with predominantly delta activity. Men aged 20-29 years spend about 21% of their total sleep in SWS, those aged 40-49 years spend about 8% in SWS, and those aged 60-69 spend about 2% in SWS. Notably, elderly people's sleep comprises only a small amount of deep sleep (virtually no stage IV sleep and scant stage III sleep). Their total sleep time approximates 6.5 hours. SWS is characterized by relative body immobility, although body movement artifacts may be registered on electromyogram (EMG) toward the end of SWS. SWS, or delta sleep, is characterized, as the name implies, by delta activity. This is typically generalized and polymorphic or semirhythmic. By strict sleep staging criteria on polysomnography, SWS is defined by the presence of such delta activity for more than 20% of the time, and an amplitude criterion of at least 75 µV is often applied. The distinction between stage III and stage IV sleep is only a quantitative one that has to do with the amount of delta activity. Stage III is defined by delta activity that occupies 20-50% of the time, whereas in stage IV, delta activity represents greater than 50% of the time. Sleep spindles and K complexes may persist in stage III and even to some degree in stage IV, but they are not prominent. 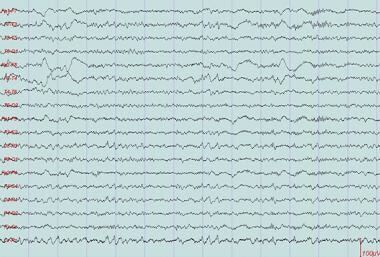 As already mentioned, SWS is usually not seen during routine EEG, which is too brief a recording. 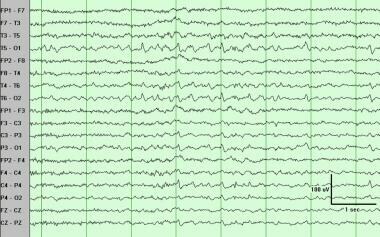 However, it is seen during prolonged EEG monitoring. One important clinical aspect of SWS is that certain parasomnias occur specifically out of this stage and must be differentiated from seizures. These slow wave sleep parasomnias include confusional arousals, night terrors (pavor nocturnus), and sleepwalking (somnambulism). REM sleep normally is not seen on routine EEGs, because the normal latency to REM sleep (100 min) is well beyond the duration of routine EEG recordings (approximately 20-30 min). The appearance of REM sleep during a routine EEG is referred to as sleep-onset REM period (SOREMP) and is considered an abnormality. While not observed on routine EEG, REM sleep commonly is seen during prolonged (>24 h) EEG monitoring. Representative examples of waveforms described here can be seen in the images below. Rapid eye movement sleep with rapid (saccadic) eye movements. While muscle "atonia" cannot be proven without a dedicated electromyogram (EMG) channel, certainly EMG artifact is absent with a "quiet" recording. Also, no alpha rhythm is present that would suggest wakefulness. Typical saccadic eye movements of rapid eye movement sleep are shown, with lateral rectus "spikes" seen just preceding the lateral abducting eye movements. In addition to rapid eye movements, this rapid eye movement sleep record is characterized by brief fragments of alpha rhythm (first half) and central saw tooth waves (second half). This is a good example of saw tooth waves seen in rapid eye movement sleep and their "notched" morphology. This is a good example of saw tooth waves seen in rapid eye movement sleep and their "notched" morphology, best seen here in the Cz-Pz (last) channel. This illustrates the typical appearance of saw tooth waves on a polysomnogram (PSG) display, equivalent to 1 cm/s. By strict sleep staging criteria on polysomnography, REM sleep is defined by (1) rapid eye movements, (2) muscle atonia, and (3) EEG desynchronization (compared to slow wave sleep). Thus, 2 of the 3 defining characteristics are not cerebral waves and theoretically require monitoring of eye movements (electro-oculogram [EOG]) and muscle tone (electromyelogram [EMG]). Fortunately, muscle activity and eye movements can be evaluated on EEG; thus, REM sleep is usually not difficult to identify. In addition to the 3 features already named, "saw tooth" waves also are seen in REM sleep. EEG desynchronization: The EEG background activity changes from that seen in slow wave sleep (stage III or IV) to faster and lower voltage activity (theta and beta), resembling wakefulness. Saw tooth waves are a special type of central theta activity that has a notched morphology resembling the blade of a saw and usually occurs close to rapid eye movements (ie, phasic REM). They are only rarely clearly identifiable. Rapid eye movements: These are saccadic, predominantly horizontal, and occur in repetitive bursts. Despite the lack of a dedicated EMG channel, the muscle atonia that characterizes REM sleep is usually apparent as a general sense of "quiet" muscle artifacts compared to wakefulness. The duration of REM sleep increases progressively with each cycle and tends to predominate late in the sleep period into early morning. The occurrence of REM too soon after sleep onset, referred to as SOREMP, is considered pathological. However, newborns and infants enter REM more rapidly and spend a higher proportion of sleep in REM (this is true in most species and supports the theory that REM sleep is involved in brain development). For excellent patient education resources, see eMedicineHealth's patient education articles Sleep: Understanding the Basics and Electroencephalography (EEG). 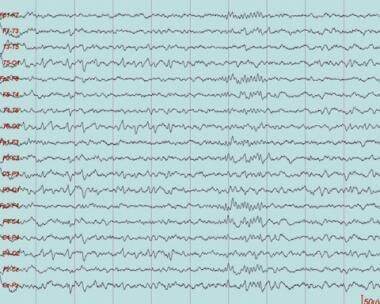 What is normal sleep EEG? 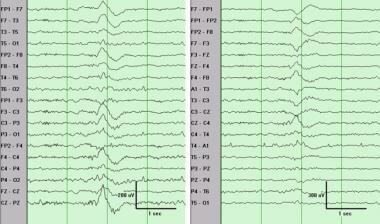 How is stage I sleep defined on normal sleep EEG? 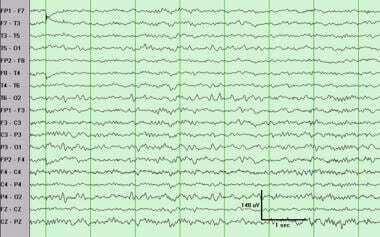 What are the EEG waveform features of drowsiness in stage I sleep? 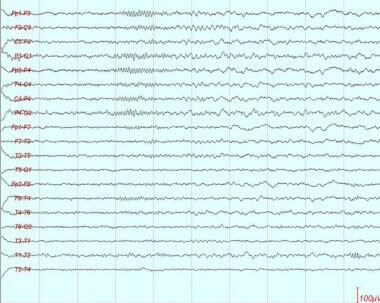 How is stage II sleep defined on normal EEG? 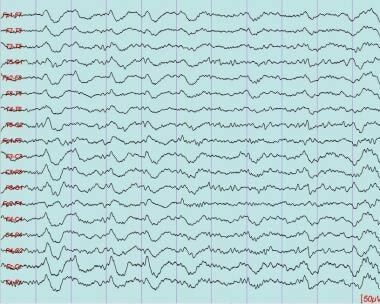 What are the EEG waveform features of stage II sleep? 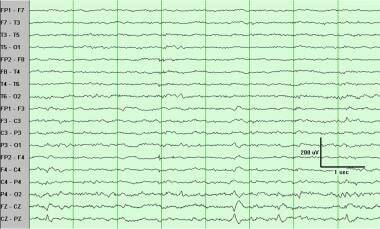 How are stage III and IV sleep defined on normal sleep EEG? 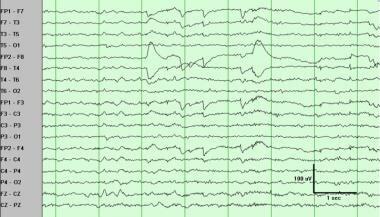 What are the EEG waveform features of stage III and IV sleep? How is rapid eye movement (REM) sleep defined on normal sleep EEG? 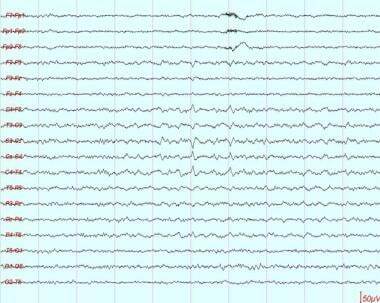 What are EEG waveform features of rapid eye movement (REM) sleep? Aserinsky E, Kleitman N. Two types of ocular motility occurring in sleep. J Appl Physiol. 1955 Jul. 8(1):1-10. [Medline]. Hirshkowitz M., Whiton K., Albert S., et al. National Sleep Foundation’s sleep time duration recommendations: methodology and results summary. Sleep Health. March 2015. 1(1):40-43. [Full Text]. Williams RL, Karacan I, Hursch CJ. EEG of Human Sleep: Clinical Applications. New York, NY: John Wiley & Sons; 1974. Benbadis SR, Perry MC, Wolgamuth BR, et al. The multiple sleep latency test: comparison of sleep onset criteria. Sleep. 1996 Oct. 19(8):632-6. [Medline]. Benbadis SR, Wolgamuth BR, Perry MC, Dinner DS. Dreams and rapid eye movement sleep in the multiple sleep latency test. Sleep. 1995 Feb. 18(2):105-8. [Medline]. 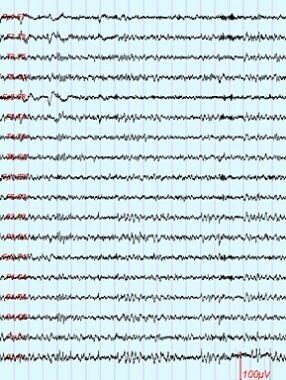 Chatrian GE, White LE Jr, Daly D. Electroencephalographic patterns resembling those of sleep in certain comatose states after injuries to the head. Electroencephalogr Clin Neurophysiol. 1963 Apr. 15:272-80. [Medline]. Chockroverty S. An overview of sleep. Chockroverty S, ed. Sleep Disorder Medicine: Basic Science, Technical Considerations, and Clinical Aspects. Boston, Mass: Butterworth-Heinemann; 1999. 7-20. Cote KA, de Lugt DR, Langley SD, Campbell KB. Scalp topography of the auditory evoked K-complex in stage 2 and slow wave sleep. J Sleep Res. 1999 Dec. 8(4):263-72. [Medline]. Daly DD, Pedley TA. Current Practice of Clinical Practice of Electroencephalography. 2nd ed. New York, NY: Raven Press; 1990. 574-5. Dement W, Kleitman N. Cyclic variations in EEG during sleep and their relation to eye movements, body motility, and dreaming. Electroencephalogr Clin Neurophysiol Suppl. 1957 Nov. 9(4):673-90. [Medline]. GIBBS EL, GIBBS FA. 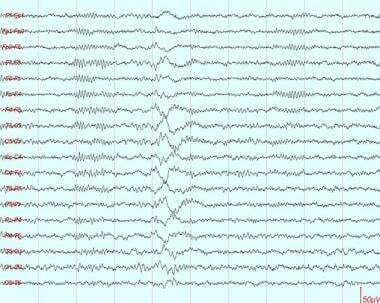 Extreme spindles: correlation of electroencephalographic sleep pattern with mental retardation. Science. 1962 Dec 7. 138:1106-7. [Medline]. Loomis AL, Harvey EN, Hobart G. Distribution of disturbance patterns in the human electroencephalogram with special reference to sleep. J Neurophysiol. 1938. 1:413-30. Loomis AL, Harvey EN, Hobart GA. Brain potentials during hypnosis. Science. 1936. 83:239-41. Loomis AL, Harvey EN, Hobart GA. Cerebral states during sleep, as studied by human brain potentials. J Exp Psychol. 1937. 21:127-44. Loomis AL, Harvey EN, Hobart GA. Potential rhythms of the cerebral cortex during sleep. Science. 1935. 81:597-8. Monstad P, Guilleminault C. Cardiovascular changes associated with spontaneous and evoked K-complexes. Neurosci Lett. 1999 Mar 26. 263(2-3):211-3. [Medline]. Naitoh P, Antony-Baas V, Muzet A, Ehrhart J. Dynamic relation of sleep spindles and K-complexes to spontaneous phasic arousal in sleeping human subjects. Sleep. 1982. 5(1):58-72. [Medline]. Reynolds CF 3rd, Kupfer DJ, Taska LS, et al. EEG sleep in elderly depressed, demented, and healthy subjects. Biol Psychiatry. 1985 Apr. 20(4):431-42. [Medline]. Sakai T, Kohsaka S, Kohsaka M. Functional changes of the brainstem triggering vertex sharp wave with spindle. Psychiatry Clin Neurosci. 1999 Apr. 53(2):167-9. [Medline]. Steriade M. Neurophysiological mechanism of non-rapid eye movement (resting) sleep. Chokroverty S, ed. Sleep Disorders Medicine: Basic Science, Technical Considerations, and Clinical Aspects. Boston, Mass: Butterworth-Heinemann; 1999. 51-62. Vignaendra V, Matthews RL, Chatrian GE. Positive occipital sharp transients of sleep: relationships to nocturnal sleep cycle in man. Electroencephalogr Clin Neurophysiol. 1974 Sep. 37(3):239-46. [Medline].